As we find more use for the land around us, the boundary between humans and wildlife becomes less distinctive. Deer may wander into residential areas in search of food, especially when there is a large population of deer and very little food to sustain them. Keep in mind that deer are highly adaptable to changes in their environment and as we encroach further into their territory they become more familiar with humans. If they encounter a lack of food, they will not be afraid to look for nourishment in your garden. Deer can cause damage to gardens and trees in a number of different ways. They feed on leaves, stems, flowers, and bark, and crush flowerbeds with their hooves. 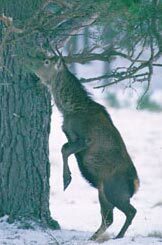 Males often rub their antlers on tree trunks, causing bark to shed and trunks to splinter or split. This type damage often occurs during the fall season between the months of September and November. Deer are host to deer ticks, which may carry Lyme disease. Lyme disease is a bacterial disease that is transmittable to humans through tick bites. Signs of Lyme disease include a ring-shaped rash, flu-like symptoms and muscle aches. If you experience these symptoms after receiving a tick bite, it is best to contact your physician for a diagnosis. You may find evidence of deer presence first by searching for track marks in the mud, soil or snow. Hoof prints are generally 3 to 4 inches in length. Another sign to look for are deer droppings. Deer droppings are pellet-like, elongated and may appear in clumps. If you notice that the branches and twigs in your garden are rough and shredded, rather than bitten with a clean cut, it is likely that deer are the culprit. They are not equipped with sharp upper incisors, so deer feeding on trees results in tattered-looking branches. Deer usually feed in the early hours of the morning. Damage can be more severe in areas with a high deer population and scarce food sources. There are some plants and trees that are said to be more deer resistant than others, but when faced with starvation deer will likely eat anything that is available. You may consider constructing a physical barrier around your property, such as a high fence, but this can often be prohibitively expensive as well as unsightly. When used properly, repellents can be effective ways to keep deer away from your plants. Click here for a list of products recommended for controlling deer.